Today is the First Sunday after the Epiphany. 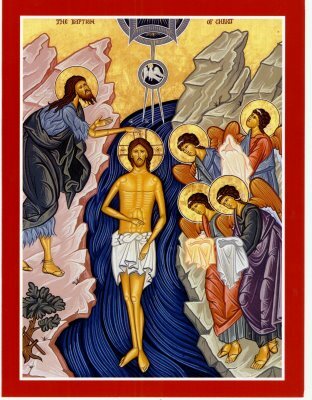 On this day we always celebrate the Feast of the Baptism of our Lord. The collect and readings for today may be found here. Since the readings from Isaiah and Luke seem connected I have included both below. Thus says the Lord, he who created you, O Jacob, he who formed you, O Israel: Do not fear, for I have redeemed you; I have called you by name, you are mine. 2When you pass through the waters, I will be with you; and through the rivers, they shall not overwhelm you; when you walk through fire you shall not be burned, and the flame shall not consume you. 3For I am the Lord your God, the Holy One of Israel, your Savior. I give Egypt as your ransom, Ethiopia and Seba in exchange for you. 4Because you are precious in my sight, and honored, and I love you, I give people in return for you, nations in exchange for your life. 5Do not fear, for I am with you; I will bring your offspring from the east, and from the west I will gather you; 6I will say to the north, “Give them up,” and to the south, “Do not withhold; bring my sons from far away and my daughters from the end of the earth— 7everyone who is called by my name, whom I created for my glory, whom I formed and made. I wish it were that easy, that clear, that simple. I wish I could say to the sorrows and losses of my life, “You can’t touch me. I’ve been baptized!” I wish I could say to the struggles and difficulties of my life, “You can’t touch me. I’ve been baptized!” I wish I could say to the changes and chances of life, “You can’t touch me. I’ve been baptized!” But that is not how baptism seems to work. Despite my baptism I have, like every one of you, suffered sorrows and losses of life, encountered difficulties and struggles, had to face the changes and chances of life I would rather have avoided. And despite his baptism that little boy in the story still went to time-out. And yet he speaks a deep truth. He is absolutely right; he is untouchable. At some level he knows that his existence, identity, and value are not limited to time and space; to the things he has done or left undone. He knows himself to be more than his biological existence. He knows himself as beloved. He knows the gift of baptism. Baptism does not eliminate our difficulties, fix our problems, take away the pain, or change the circumstances of our lives. Instead it changes us and offers a way through those difficulties, sorrows, problems, and circumstances and ultimately, a way through death. Baptism transcends our biological existence and offers us a vision of life as it might be. Baptism offers us a new way of being – one that is neither limited by nor suffers from our “createdness.” Through baptism we no longer live according to the biological laws of nature but by relationship with God. Do not fear, for I have redeemed you; I have called you by name, you are mine (Isaiah 43:1). That means when we pass through the waters of sorrow and difficulty God is with us. The rivers that can drown will not overwhelm us. That means when we walk through the fire of loss and ruination we are not burned. The flames that can destroy will not consume us. For he is the Lord our God, the Holy one of Israel, our Savior. To know this, to trust this, to experience this is the gift of baptism and baptism always takes place at the border of life as it is and life as it might be. That border is the river Jordan. Geographically, symbolically, and theologically the Jordan River is the border on which baptism happens. It is the border between the wilderness and the promised land; the border between life as survival and a life that is thriving; the border between sin and forgiveness; the border between the tomb and the womb; the border between death and life. We all stand on that border at multiple points in our lives. Some of you stand there now. Some of you experience that border as a place of loss, fear, pain. For others it is a place of joy, hope, and healing. In reality it is both at the same time. The only reason we can stand at the border of baptism is because Jesus stood there first. We stand on the very same border on which his baptism took place. When Jesus also had been baptized and was praying, the heaven was opened, 22and the Holy Spirit descended upon him in bodily form like a dove. And a voice came from heaven, “You are my Son, the Beloved; with you I am well pleased.” (Luke 3:21-22). Jesus’ baptism is for our sake and salvation. His baptism makes ours possible. The water of baptism does not sanctify Jesus. Instead he sanctifies the water for our baptism. The water that once drowned is now also sanctified water that gives life. Ritually we are baptized only once. Yet throughout our life we return to the waters of baptism. Daily we return to the baptismal waters through living our baptismal vows. We confess our belief in God, Father, Son, and Holy Spirit, because God first believed in and chose us. We continue in the apostles’ teaching and fellowship, in the breaking of bread, and in the prayers because the Holy Spirit has descended upon and filled us. We persevere in resisting evil, and whenever we fall into sin, repent and return to the Lord because the heavens have been opened to us and we have seen our true home. We proclaim by word and example the good news of God in Christ because we have heard the voice from heaven declare us beloved children in whom he is well pleased. We seek and serve Christ in all persons, loving our neighbor as ourselves; striving for justice, peace, and dignity for every human being because that is how God has treated us and how could we do any less for another one of his children. Other times our own body provides the waters of baptism – tears. Then there are the circumstances of life, things done and left undone by us and others, the ups and downs of living that push at back to the borderland. We return in order to again be immersed into the open heavens, to be bathed by God’s breath – the Holy Spirit, and to let the name “beloved” wash over us. There is truth is what that little boy said, “You can’t touch me. I’ve been baptized!” Do you believe that? Can you say it and claim it for yourself? “You can’t touch me. I’ve been baptized!” “You can’t touch me. I’ve been baptized!” Now go live it.